Even if you haven’t been to Miami’s South Beach (SoBe), you’ve definitely heard of its pastel-colored Art Deco buildings, party-till-the-sun-comes-up nightlife, the crystal clear warm ocean, and soft white sand beaches. But, have you heard of the Beach’s South of Fifth neighborhood, known to locals as just “SoFi” (pronounced “Sophie”)? SoFi is a predominantly residential area (think luxury condos and locals on bikes) that runs from South Pointe Park up to 5th Street—a quieter part of town, home to some of the Beach’s most famed bars and restaurants like Nikki Beach, Joe’s Stone Crab, Monty’s, Prime 112 and Tap Tap—and is just a two-minute drive to the causeway that takes you back into the mainland (downtown Miami, Brickell, Wynwood and the Design District). Built from the foundation of the third-oldest Miami Beach hotel, The Julia—an adults-only property named after Miami’s founder, Julia Tuttle—just opened in SoFi last September 2017. If it’s fancy you’re looking for, this isn’t the place for you. 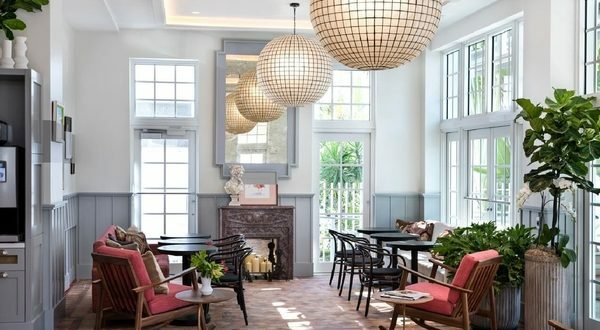 The boutique, 29-room hotel is a simple place with complimentary coffee, tea and breakfast (pastries are from Zak the Baker) and a partnership with Boucher Brothers to provide guests with beach chairs and towels from 9 a.m. to 5 p.m. daily. At $130 a night, The Julia is affordable without being cheap or cheesy—especially when you’re pining for a quiet-ish vacay in a walkable, not so debaucherous part of the Beach. The hotel features traditional Art Deco decor and its original 1930s Cuban tile flooring, combined with modern updates. The daily wine and cheese happy hour, along with the lobby’s thought-provoking art installations, is a nice touch that encourages conversation in a community driven space. The Julia’s symbol is the American white ibis, a wading bird with a bright pink beak that’s native to Florida. You’ll see lots of subtle nods to the ibis throughout the space, from the pink stairs and accent walls to the small side tables with bases shaped like long bird legs. I stayed in a first floor room, no-frills with 20-foot-tall ceilings, a big bed, wooden shutters meant to let in lots of natural light and a beautiful blue paper origami chandelier. It was the perfect space for a good night’s sleep, of course, but also for taking a break from the scorching sun and tropical temps after a 2.5-hour kayak tour and lunch at Icebox just up the road. Having grown up in Miami, a lot of the places I revisited evoked a certain nostalgia. I can’t count the number of times I partied on South Beach in my early 20s and ended up inside Big Pink (a casual diner owned by the same restaurant group as the upscale Prime 112), ordering eggs and pancakes at 3 a.m.
What used to be a divey little locals’ bar known as the Room (I frequented it with friends many years ago) is now called Scape Goat and the literature nerd in me is screaming. The cocktail bar situated next to New York-style Primo Pizza specializes in whiskey drinks, is as dark and cozy as ever and has been updated with a black bar, Carrera marble countertops, Victorian-style mirrors and gold-framed artwork. The biggest Italian restaurant in South Beach, Cibo, is great for a girls’ night (I had a cousin’s bachelorette dinner there last year) with lots of wine. The restaurant has 3,500 bottles of it to be exact—in a two-story, award-winning wine room—which is accessed by a harnessed “Wine Angel” on the way to your table. A SoFi getaway will most likely be filled with eating and drinking, so if you’re up to it, hop in a Lyft and escape the beach for a bit of museum culture. Downtown Miami is home to the Perez Art Museum (contemporary art) and the Phillip and Patricia Frost Museum of Science, which are next door to each other and both have breathtaking water and city views. See if you can spot the historic Freedom Tower from the Frost Museum’s sixth floor Lunar Terrace. Previous What does your vacation smell like? Trump effect, low loonie not stopping Canadians from visiting U.S.